As the curtain rises on this incredible novel, readers stand by the side of a seventeen-year-old girl named Ismae, as she finds herself locked into a marriage by her cruel, horrendous father. Ismae has had a hard life, harder than anyone could ever dream. When she was born, an herbwitch gave her mother a poison saying that Ismae’s real father was the God of Death. Ismae survived the birth, however, she is stamped with the hideous scars that the poison left behind. Soon, thankfully, Ismae is saved from the new husband who finds her to be nothing but a Beast, and is taken off in the middle of the night by a priest who drops her at a convent. Now this is a strange convent, to say the least. The women here work for Death. They are actually nuns who are trained assassins; nuns who make poisons and go out on assignments to rid the world of the people who have the ‘marque of death.’ Ismae doesn’t care about the violence, she only cares about the fact that someone now loves, needs, and is kind to her no matter what. And her gifts…the gifts that Death has given her soon come out for the world to see. Not only can this girl avoid death and not even be affected by poison that would kill anyone else in seconds, she can also ‘feel’ people’s souls as they exit their human forms. An assignment comes about that involves a spy, and takes Ismae into a regal world where she must ‘hide’ under the concept of being a courtesan to a man who is, supposedly, doing his best to save a country as the worlds of France and England collide in war, secrets and lies. But what will Ismae do if she falls in love with this man who has his own agenda? 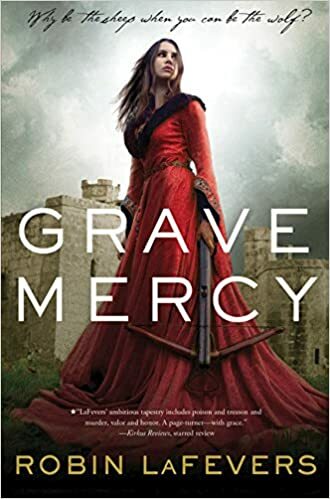 Add to that another nun assassin who seems to always be knee-deep in trouble and you have a remarkable story that offers everything from the paranormal to fantasy to history to romance to excitement - and the list goes on. Mythology also reigns in this dark, captivating story. And, although violent, will have readers from the ages of 14 though 70 chomping at the bit in order to see how it all plays out. Quill Says: Incredible plot, memorable characters, and twists and turns that will have you wishing this was being made into a movie!